Beijing is again in the spotlight as it is hosting a summit of the Forum on China-Africa Cooperation (FOCAC) tomorrow and Tuesday. In a diplomatic career lasting more than 40 years, I served in two African countries and have seen with my own eyes the growth of China-Africa relations and the benefits of the ever-deepening cooperation between the two sides. As a trustworthy friend and sincere partner of Africa, China has upheld four principles. The first principle is equality. A saying in Africa goes,"A river runs deep, thanks to its source." The source of the deep-running China-Africa friendship is that the two sides have helped and supported each other and shared weal and woe in the pursuit of national independence and development. Tazara, the rail road between Tanzania and Zambia, is a testimony to the strong brotherhood between China and Africa. While working in Africa, I had the honour to attend the handover ceremony of Tazara and witnessed the dedication of this historic monument of China-Africa friendship. China and Africa are true friends who respect each other's choice of development path and never impose their will on each other. Africa belongs to the African people, and African issues should be determined by the African people. China never preaches at or exports its model to Africa, nor does China attach any political strings to China-Africa cooperation. The second principle is win-win cooperation. A Chinese adage goes,"It is difficult to lift a heavy object alone; it is easier if you do it with many others." China and Africa's cooperation has been mutually beneficial. It has been conducive to China's development. It has also helped tackle Africa's development bottlenecks, such as inadequate infrastructure, capital shortage and lack of expertise, and improve Africa's capability of long-term, sustainable development. China has been the largest trading partner of Africa for nine consecutive years. In 2017, two-way trade reached $170 billion (£131 billion). China's investment stock in Africa has surpassed $100 billion. China-Africa cooperation on the Belt and Road Initiative has been thriving, delivering tangible results such as the Addis Ababa-Djibouti Railway,the Mombasa-Nairobi Standard Gauge Railway and the Hisense Home Appliances Industrial Park in South Africa. The third principle is honouring commitment. There is no shortage of international mechanisms dedicated to African development. Making promises is not enough. It is more important to deliver. China has built hundreds of schools and hospitals, provided training to over 160,000 people and offered government scholarships to over 20,000 students in Africa. At the outbreak of Ebola in Africa, China took prompt action to provide 750 million RMB yuan in aid (£85 million). Chinese medical teams have been working in Africa since 1960s and have helped cure more than 300 million patients. Since 2016, China has provided emergency food aid to 18 African countries hit by natural disasters. When I was Ambassador to Egypt, the China-built distance learning project was completed and provided strong support for the country's capability of human resource training. The fourth principle is openness and inclusiveness. China-Africa cooperation is open and transparent and excludes no one. China stands ready to work with all countries that care for Africa and leverage its resources and advantages to help with Africa's development. 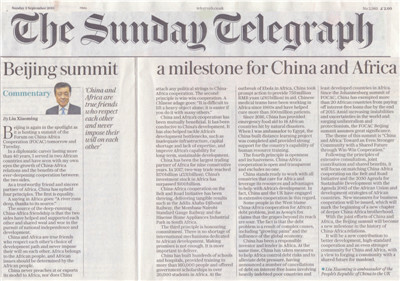 In fact, China and the UK have engaged in extensive cooperation in this regard. 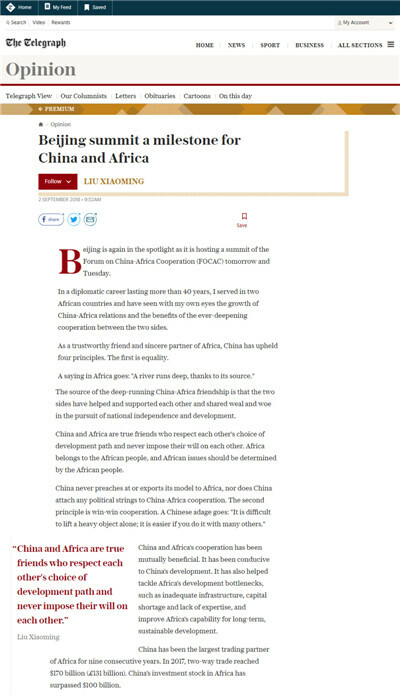 Some people in the West blame China-Africa cooperation for Africa's debt problem, just as Aesop's fox claims that the grapes beyond its reach are sour. The fact is that the debt problem is a result of complex causes, including the "growing pains" and the influence of global economy. China has been a responsible investor and lender in Africa. At the same time, China has taken measures to help Africa control debt risks and to alleviate debt pressure,having announced a number of cancellations of debt on interest-free loans involving heavily indebted poor countries and least developed countries in Africa. Since the Johannesburg Summit of FOCAC, China has exempted more than 20 African countries from paying off interest-free loans due by the end of 2015. Amid increasing instabilities and uncertainties in the world and surging unilateralism and protectionism,the FOCAC Beijing Summit to be held at the beginning of September assumes great significance. The theme of this Summit is"China and Africa: Toward an Even Stronger Community with a Shared Future through Win-Win Cooperation". Following the principles of extensive consultation, joint contribution and shared benefits, it will focus on matching China-Africa cooperation on the Belt and Road Initiative and the 2030 Agenda for Sustainable Development with the Agenda 2063 of the African Union and development strategies of African countries. New measures for business cooperation will be issued, which will mark the beginning of a new chapter of deeper China-Africa brotherhood. With the joint efforts of China and Africa, the Beijing Summit will become a new milestone in the history of China-Africa relations. It will be a new contribution to better development, high-standard cooperation and an even stronger community for China and Africa, with a view to forging a community with a shared future for mankind.